Vintage look, Fleur de Lis bed crown embellished with white pearl and pink rhinestones. There is a bar on the back to drape tulle or other light weight fabric over to serve as your canopy....tulle is sold separately. Matching crown hooks are included to swag your canopy. 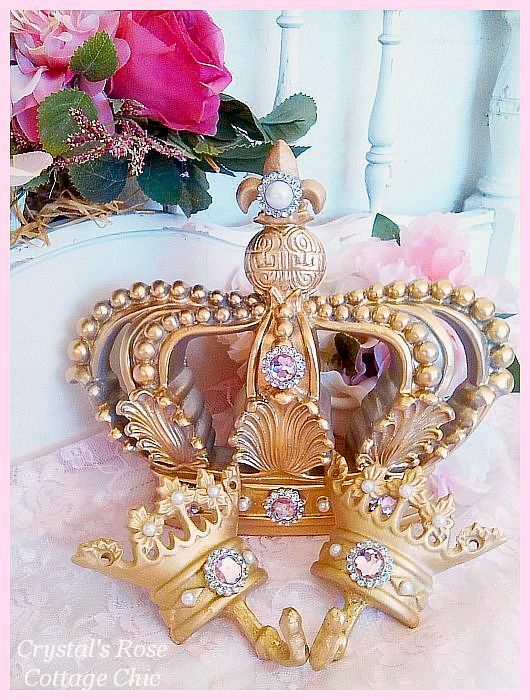 Bed crown is made of resin and measures 12.5" wide x 8.5" tall x 2" deep. These also work beautifully over sweet/dessert tables for Princess parties, bridal showers, etc..Color choices available from drop down menus below.